Today, 6 December, an official ceremony was held at the Bovanenkovskoye field to celebrate the commissioning of the field’s third and final gas production facility and the Ukhta-Torzhok 2 gas trunkline. "Gazprom’s Ukhta-Torzhok 2 gas pipeline in operation"
The ceremony was attended by Alexey Miller, Chairman of the Gazprom Management Committee, Dmitry Artyukhov, Governor of the Yamal-Nenets Autonomous Area, and heads of the Company’s relevant subdivisions, subsidiaries and contracting organisations. The Yamal gas production centre has strategic importance, as it will assume the primary role in the national gas industry throughout the 21st century. In a mere ten years, Gazprom created a powerful industrial complex at the Bovanenkovskoye field, building transport (including a railroad and an airport) and utility infrastructure in the severe Arctic conditions of the Yamal Peninsula from the ground up. In 2012, Bovanenkovskoye’s gas production facility No. 2 came on-stream, followed by gas production facility No. 1 in 2014. Today, gas production facility No. 3 was brought into operation. The facility includes, inter alia, a gas treatment unit with the annual capacity of 30 billion m3 of gas. As a result, the field has reached its design production capacity of 115 billion m3/y of gas. Gas from Yamal is delivered to consumers via the gas pipelines of the northern gas transmission corridor, which is becoming the key route of Russia’s Unified Gas Supply System (UGSS). Since 2012, the Company has brought on-stream the state-of-the-art and highly efficient Bovanenkovo-Ukhta, Ukhta-Torzhok and Bovanenkovo-Ukhta 2 gas pipelines within this corridor. Today, the Ukhta-Torzhok 2 gas pipeline was connected to the UGSS. The new gas pipeline is 970 km long and has a design throughput of 45 billion m3/y of gas. For its development operations in Yamal, Gazprom employs advanced technological solutions and highly reliable equipment. For instance, every facility at Bovanenkovskoye operates with the help of modern automation systems and lightly manned technologies. Particular attention is paid to maintaining a high level of industrial safety and preserving the natural environment of the Arctic. To that end, the use of vapour-liquid heat stabilisers and heat-insulated pipes in wells helps minimise impacts on the permafrost. The domestically-produced pipes used in the Ukhta-Torzhok 2 gas pipeline are made of cold-resistant steel and protected from corrosion by special long-life external insulation. The pipes also have internal coating that makes gas transmission more efficient. 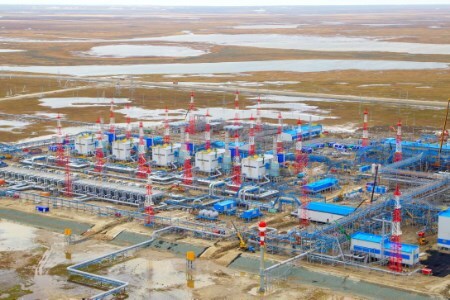 “The commissioning of the third production facility at Bovanenkovskoye is a landmark event for the Russian gas industry. Now, the main field in Yamal has all of its key facilities up and running. Gas production operations will continue here until 2128. We have made yet another step toward achieving the government-mandated goal of creating the main Russian gas production centre in the Arctic,” said Alexey Miller.